1 Chop cashews (not too finely), put on a plate and set aside. 2 Rinse chard, spin dry and cut to separate the thick stems. 3 Cut stems crosswise into very thin strips. Blanch in a pot of boiling salted water just to par-boil, about 2 minutes. Drain and plunge stems into a bowl of ice water. Drain well. 4 Cut chard leaves into strips, about 2 cm (approximately 3/4 inch) wide. 5 Rinse chile pepper, halve lengthwise and remove seeds. Coarsely chop chile. Peel and finely chop garlic and ginger root. 6 Separate egg. (Reserve yolk for another use.) In a small bowl, whisk egg white. Rinse chicken breasts, pat dry and season with salt and pepper. 7 Dip top of chicken breasts in beaten egg white and then into cashews, pressing firmly to adhere. Place chicken, coated side up, on a parchment-lined baking sheet. Bake in preheated oven at 200° C (fan: 180°C, gas: level 3) (approximately 400°F) until chicken is cooked through and crust is golden brown, 12-15 minutes. 8 Heat the oil in a nonstick pan. Sauté chard leaves on high heat, stirring constantly, just until wilted slightly, about 1 minute. 9 Add chard stems, garlic, ginger and chile and cook, stirring, until fragrant, about 45 seconds more. 10 Stir in soy sauce and, if needed, a little water. 11 Cover and cook over medium heat until vegetables are tender, 3-4 minutes. Season with salt and pepper. Remove lid and cook until all the liquid evaporates. 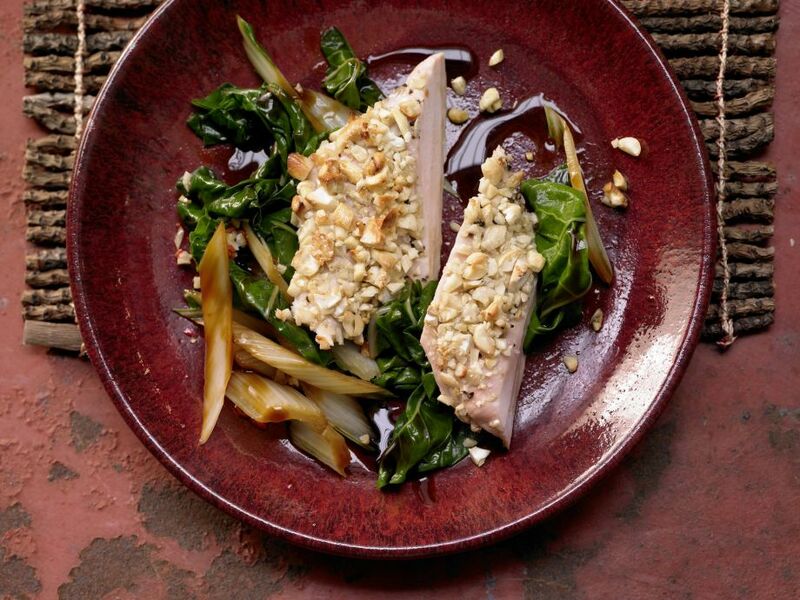 Serve chard mixture topped with chicken.